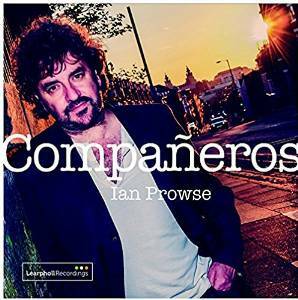 The iTunes release of Ian Prowse's 2015 album Companeros is good enough reason for us to revisit it as it's no ordinary album. What the Amsterdam and Pele front man has succeeded in doing is giving a new life to songs written by what he describes as "troubadours hidden away in these islands", putting his own interpretations on songs that have moved him over the years by fellow artists he's met on his travels who, for whatever reason, have not had the opportunity to get their music heard by a wider audience. The concept sounds like it could be an almighty disaster, but it's an unmitigated triumph as Ian treats the songs with the respect they deserve whilst also making his own inimitable mark upon them. The songs and the comprehensive sleeve notes tell of how Ian came across the artists and songs and how they influenced him. The wonderfully buoyant and crisp Celtic folk of Kevin Jamieson's Town And Country Blues, is resplendent with brass and a joyful playful mood running through it. It's one of those songs that, as it did for Ian, you will find lodged in your head for days unable to shake it, even if you were foolish enough to want to. My Name Is Dessie Warren is a sad but belligerent tale of a trade unionist imprisoned in the 1970s by Alun Parry which holds true to Ian's own political views and intransigent refusal to conform. Mississippi Beat is a song written by Jez Wing, who played keyboards with Ian around the turn of the century. It also features Pauline Scanlon on vocals and is a beautifully written and delivered duet full of love and longing, which shows a different side to Ian than what's gone before and what comes after it. What Am I To You continues the Celtic theme that appears at points of the record. It's a song by Irish songwriter Eoin Glackin and its beauty in its simplicity, affecting through the emotional simplicity of the words that ask the question in the title. It's followed by the reflective You Can't Win Em All Mum, again with wonderful understated brass in the song's breakdown, from The Lost Soul Boys and it feels like Ian is the perfect spokesman for these wonderful songwriters that you and I have never heard of. The political slant of the album comes back with Derry Gaol, Ian's favourite song on the album, and is one of the harder songs on the album in delivery, nodding to but then veering away from those Celtic influences that the song's title suggests. Damien Dempsey is probably the best known of the artists whose songs Ian works with here. A pedal steel, bass and ukulele provide an understated backing that allows Ian to accentuate the words and the message of the song which ends in the hanging of the song's protagonist. Johnny & Marie sees Ian move back closer to home to cover Phil Jones, one of those artists that ever city worth its salt possesses, a tale of love in a working class city against the odds and another song that you'll have stuck in your head after one listen, particularly the chorus, and delivered with respect to one of Ian's heroes but with his own slant on it too. It's probably our favourite on the album. Conscience is a song that goes back to the 1980s and The Montellas. We've never heard of them, but we'd heard plenty of this style of soul music and Ian manages to both capture the vibe of that period, but also make it sound quite contemporary, not easy when his voice isn't necessarily best suited to this style, but it works extremely well. Spare Change is another one of the big upbeat songs on the album, originally recorded by Belfast's Don Donnelly, one of those songs with an incessant infectious energy that's present in a lot of Ian's own work. The album finishes with a remake of one of Ian's own songs. Name and Number is a Pele song drenched in those Celtic influences that run through this record and you suspect a lot of Ian's own eclectic record collection. It's a live version that starts with violin and clocks in over nine minutes although it feels nothing like that long as you lose yourself along with the band as the song builds and then explodes into a cacophony of strings, guitars and vocals before swooping down then soaring back up. Companeros is proof that musicians do have the most obscure but often brilliant record collections. What Ian has done here is bravely take on an idea that could end up in disaster and create something that's an absolute triumph both in the way it reveals songwriting talent lost in the midst of time and an unresponsive industry and the ability of himself and his band to reinterpret and revisit and pay appropriate respect yet put their own edge on the songs. 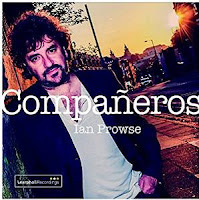 Ian Prowse (and Amsterdam) can be found on Facebook, Twitter and the album can be bought from his official site on CD and on iTunes.